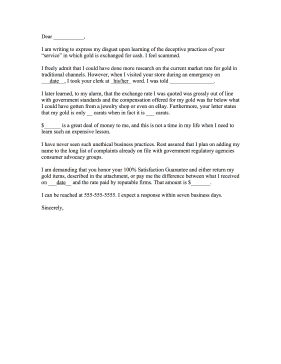 This cash-for-gold complaint letter can be printed off and filled in if transactions are deemed unacceptable. I freely admit that I could have done more research on the current market rate for gold in traditional channels. However, when I visited your store during an emergency on ___date__, I took your clerk at _his/her_ word. I was told ________________. I later learned, to my alarm, that the exchange rate I was quoted was grossly out of line with government standards and the compensation offered for my gold was far below what I could have gotten from a jewelry shop or even on eBay. Furthermore, your letter states that my gold is only __ carats when in fact it is ___ carats.